Improving the sustainability of your logistics packaging makes good business sense – and you can easily start making positive changes right now. Mark Nicholson summarises the arguments in favour of ‘green’ products and services, and highlights today’s increasing choice. When sustainable packaging materials and solutions cost less than your existing approach, what other reason do you need to change? Using an item just once, discarding it as rubbish and then making a new one is uneconomical and illogical. In practice, some environmentally friendly practices do require a bit of extra investment, but there are others which immediately boost your profits. Even if you choose to pay a little extra for environmental benefits, your company still has a lot to gain. Your efforts to protect the planet are great for public relations and will help in fulfilling your corporate social responsibility aims. Many customers feel more attracted to businesses with the right ethics. Growing support for the environment is also reflected in the development of legislation, which will inevitably continue to tighten – so why not stay ahead of it? Constantly manufacturing new packaging instead of reusing or recycling is a waste of the earth’s resources. What’s more, it means using extra energy and creating further CO2 emissions. It’s important to recognise that none of the materials are necessarily bad. For instance, although plastic may be non-biodegradable, it may be the most sustainable choice if the packaging can be reused many times. Paper cushioning is one of the simplest environmentally friendly options. We often hear the expression ‘reduce, reuse, recycle’, and this is the best priority order in which to apply those three actions. Reducing the amount of packaging should be our first aim. 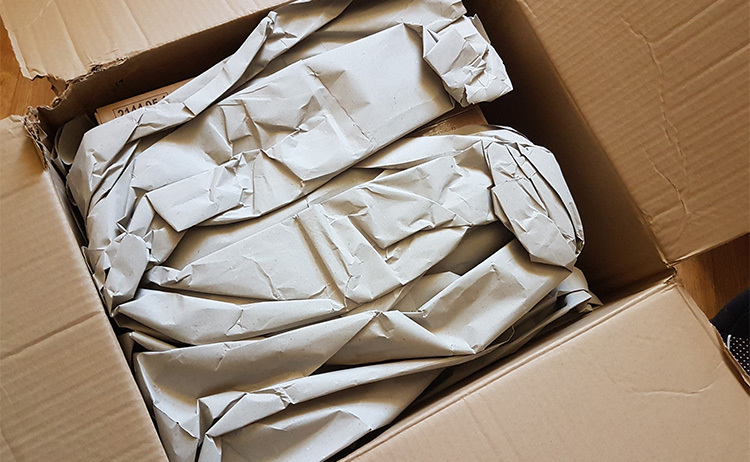 Many goods arrive in much larger containers than necessary, or with more layers of packaging than they really need. A more compact, lightweight packaging approach saves on materials, space and fuel costs. Reuse of packaging is the next priority. This saves a lot on energy consumption and CO2 emissions compared to recycling, which conserves much of the material but requires further processing and manufacturing. Composting could be viewed as a form of recycling, as the biodegraded materials go into the soil to be used again by nature. On the other hand, it takes those materials out of our reuse and recycling loops and means we must manufacture packaging again with entirely new materials. This should be viewed as the last resort, but it’s still better than using once and dumping. From the expanding variety of sustainable alternatives available today, the following examples have been selected as illustrations. Some suppliers are mentioned by name, but a quick online search will reveal many more. When it comes to reusable packaging, perhaps the most obvious products are pallets, trays and crates. Retrieving these items from customers after use is a possibility, although that may involve a lot of additional work and planning. Pooling companies like Euro Pool Group can save you that trouble by collecting, processing, cleaning and resupplying them. For fresh foods, plastic trays and crates are often preferred due to their ease of cleaning. In many respects wooden pallets are considered more sustainable than plastic, although each material has its benefits. 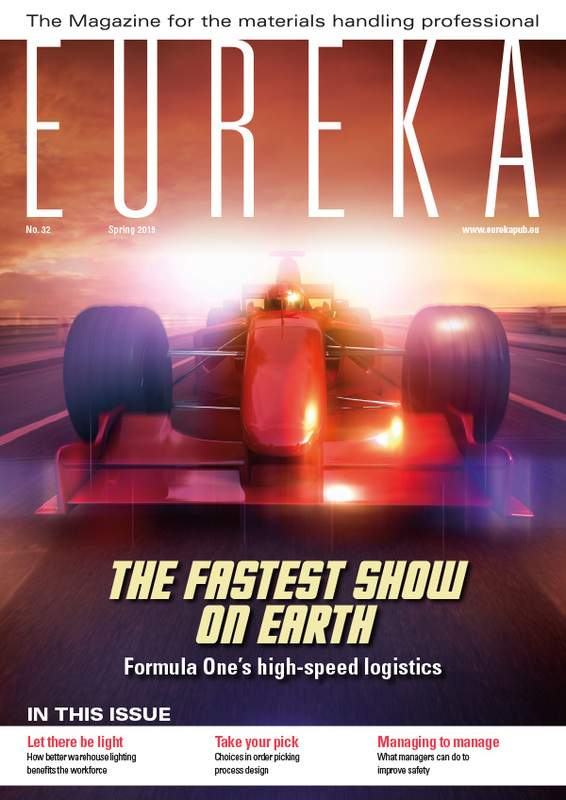 These have been compared previously in Eureka issue 21. 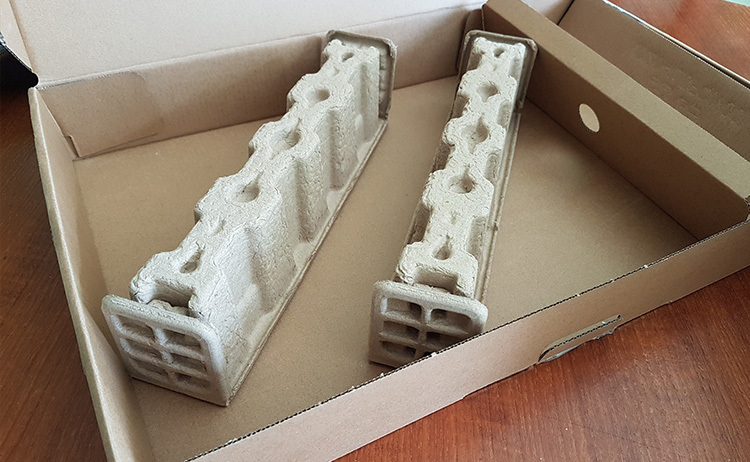 Goplasticpallets.com is one of several manufacturers making new plastic pallets from waste plastics – which is a sustainability bonus. Cardboard boxes don’t last as long as plastic containers, but they should certainly be used more than once. If a box is required only for transport, and has no advertising role, there is no need for it to be in pristine condition. UK-based box specialist Sadlers supplies used cardboard boxes at about 40% of the price of brand new ones. The company also buys them back at a much better price than recyclers pay for baled cardboard. 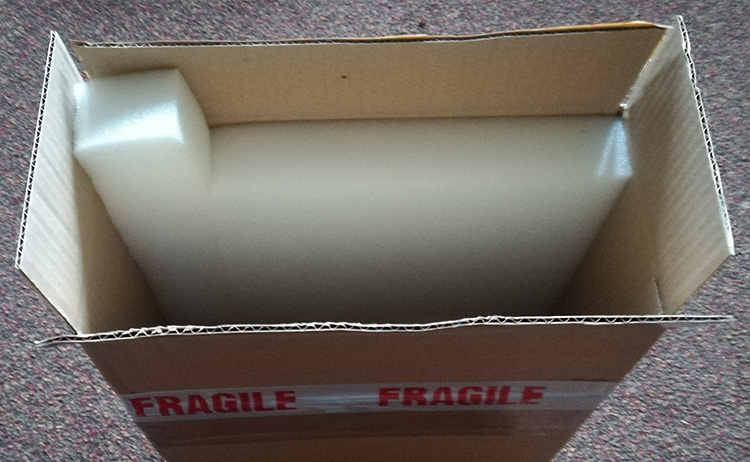 Cushioning of goods in boxes is often achieved using moulded polystyrene inserts, infilling with polystyrene pellets or packing with bubble wrap or other air-cushioned sheeting. In most cases these materials are then wastefully binned. There are plenty of easily recyclable alternatives, like moulded pulp. This cardboard-like material, which is shaped to fit the goods concerned, can be obtained from many manufacturers. You will find it in everything from fast-food outlets’ cup holders to packages for electronic products. It can be made from recycled paper and cardboard, or from wood fibres, depending on customer requirements. After use, it is easy to recycle again or to compost. Another recyclable approach is paper cushioning, as supplied by STOROpack amongst others. Paper on a roll is fed into a special on-site machine which turns it into ‘crumpled’ pads on demand. The material is recyclable, and choices include Forest Stewardship Council (FSC) certified or recycled papers. Versatile moulded pulp padding provides good protection and is easy to recycle. Research and development to create new sustainable materials continues, and one of the latest products is a compostable air pillow film from Southgate Packaging. Instead of polythene, it is made of biopolymers derived from potato waste. Added to your household compost heap, it will be ready to dig into your flower beds within six months. With so many alternatives already available, there is more reason than ever to turn away from unsustainable packaging practices. In time, pressure from customers and legislators will force businesses to change – but why not do it now, and start gaining advantages straight away? 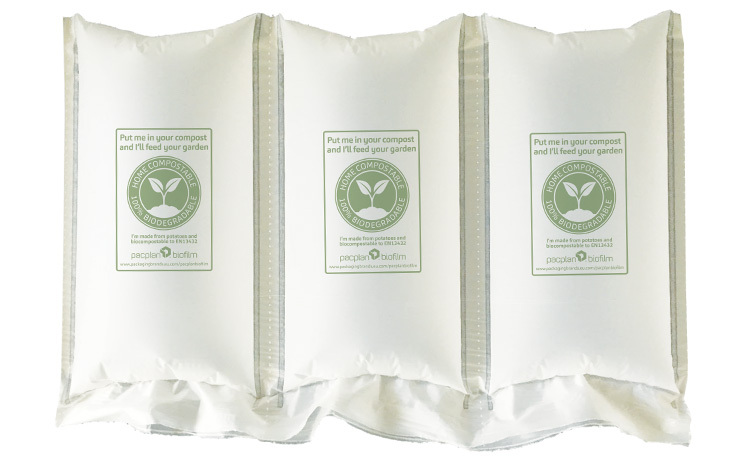 Pacplan AirWave air pillow film from Southgate Packaging, manufactured from potato waste, is easily compostable.